As a teenager farming wasn't so bad if you had the big picture instead of just seeing the little picture of what you had to do today. Many times we can be so busy doing our homework, going to school this week, and doing things, that we fail to see the big picture. Dad had the big picture as far as the farm was concerned and Campbells had the big picture as far as eternity. One other thing that Dad had decided was that I should run the sprayer or in other words be the weed killer. 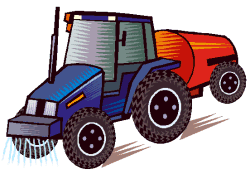 In case you don't know, a weed sprayer was put on the front of a tractor, usually spraying 35 - 100 feet plus at a time, with a tank of spray on the back. There was a time when there were no weed sprayers and they dealt with weeds by summer fallowing which meant they didn't grow a crop on a piece of land for a year. 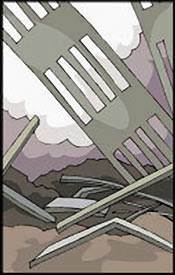 Of course the weeds would still grow with the rain and sunshine, and be killed with the cultivator. It meant that the cost of weeds was one year of crop on that land. When the sprayers came along you could use spray that would kill the weeds and not hurt the crop. Soon everyone was buying sprayers to save on the summer fallowing. Certain weeds could be taken care of by certain sprays. The question was what kind of weeds do you have? Good question. It meant we needed to get familiar with our weeds. We had Canadian thistles, wild mustard, dandelions, ragweed, and one we called stink weed—guess why? Some of these came to our farm by way of water, others by way of wind; I hope none came by way of the seed we sowed. Of course many of them would reproduce in the field year after year if we didn't get rid of them. What was the worst weed we had? It was wild oats. It looked just like wheat, oats, and barley when it was young and therefore it was hard to know if you had it until it went to seed early and dumped those bad seeds on the ground before harvest time. There was one way to find it in your field. 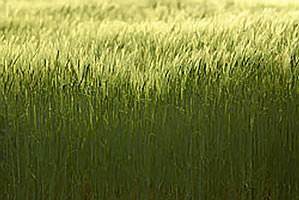 The crops that looked the same as wild oats had leaves that grew clockwise and wild oats had leaves that grew counter-clockwise. This weed could fool you if you didn't know what to look for. Being the weed killer was a big job in the summer time. A farmer could be wiped out if he didn't take care of them. Mr. Campbell knew that man can have weeds in his life and people can be destroyed by them. All spiritual weeds can be found by those who know what to look for. 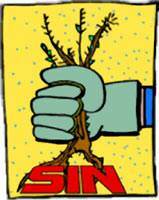 All come from one root and that is sin. And all sin comes from selfishness; and the king of selfishness is the devil. The Holy Spirit can pick out our sins and we can have them washed away by the Blood of Christ when we say yes to Him. Wild oats are deceitful and so are our hearts. Jeremiah 17:9 says, "the heart is deceitful above all things and desperately wicked." And verse 10 says, "I the Lord search the heart." 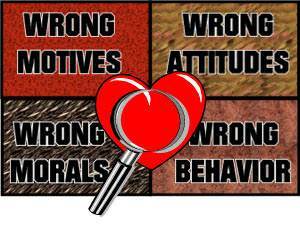 We need to check our hearts and see if they are controlled by wrong motives, wrong attitudes, wrong morals or wrong behavior. These four departments need a lot of daily examination. How awful it is when you see a field full of weeds, or a life full of sin. How wonderful if you see a field without weeds, or a life of purity and righteousness. We checked the fields for weeds by laying down a 2'x2' open-ended box and counting the weeds and their kind. Doing this in a number of different places in the field gave us a pretty good idea of what was going on. Now you know how to become a weed killer. Do you know how to become a sin killer? Mr. Campbell could have said the only thing that matters to him is his own heart. Dad could have said that the only thing that matters to him was his fields. Jesus said the field is the world. WOW! What a field! Jesus had the answer for the evil in the world and wanted to know if we would join Him in spreading the Word. Both Dad and Hugh Campbell knew that there was more to life than sitting around and seeing what happens. We could wish there weren't these problems, but they are there. Now, am I going to be a weed sprayer in Dad's fields all my life, or am I going to work in the Lord's field? What would you do? "WE ARE AT WAR AGAINST EVIL"
We are not in a political war, but we are in a spiritual war against evil. THE LAST WORLD WAR HAS BEGUN AND GOD IS GOING TO WIN IT!